St John's College was founded by Lady Margaret Beaufort in 1511. 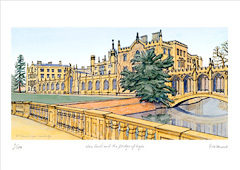 It is one of the largest Cambridge Colleges and the second richest of all the Oxbridge colleges. The college was founded on the site of the 13th century Hospital of St John. As Lady Margaret died without having mentioned the foundation of St John's in her will it was largely the work of her chaplain Saint John Fisher, the Bishop of Rochester, that ensured that the college was founded. The main entrance to St. John’s College is through the Front Gate into First Court. This gate was completed in 1516 but the heavy wooden gates with their traditional linen-fold panels date from 1665, after the gatehouse withstood a Cromwellian siege. The carving above the gate is the coat of arms of Lady Margaret Beaufort. The mythical beasts to each side are yales, with elephants' tails, antelopes' bodies and goats' heads. Above is a statue of St. John the Evangelist holding a poisoned chalice with a snake. At his feet is an eagle, the traditional symbol of the Saint. The Gate Tower of red brick dressed with stone was built by the master mason William Swayne.